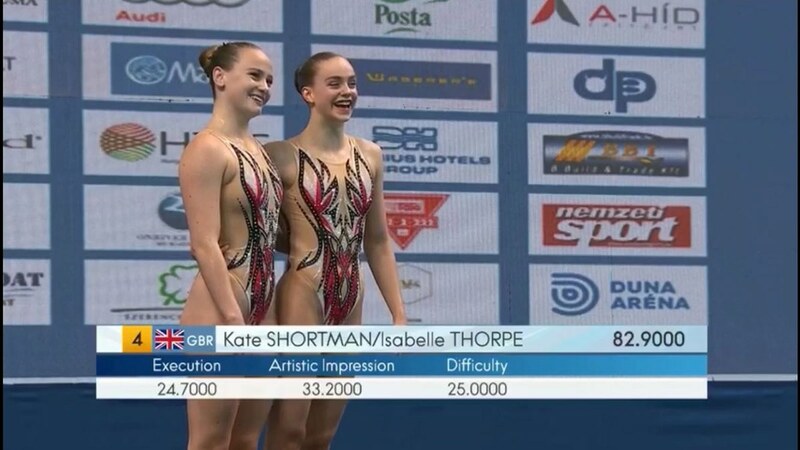 Kate Shortman and Isabelle Thorpe produced their best ever free duet performance as they achieved a top 10 finish at the Fina World Junior Synchronised Swimming Championships. They ‘exceeded expectations’ on their way to a score of 82.9000 to finish ahead of USA and Mexico and only 0.2667 behind ninth-placed Greece at the event in Budapest, Hungary. Shortman and Thorpe also claimed 10th place in the technical duet with a score of 81.6957 but it was their free duet performance which capped an excellent start to the competition for Great Britain. In the individual events, Shortman finished ninth in both the free and technical with scores of 83.8333 and 83.1096 respectively. Karen Thorpe, Swim England’s synchronised swimming manager, said: “What a junior worlds this is for us so far. We were hoping to final but to make the top 10 exceeds our expectations. “The athletes fought to the last note of their free duet, improving on height, energy and sharpness in the final. “Scoring 81 in tech was a big improvement from the Junior Europeans a few weeks ago and so was their free duet final score of 82.9, which is a new best. The championships continue until Sunday 22 July.